All visitors must enter the Bank through the main entrance, located on the pedestrian plaza at Broadway and Locust Street. You must have a valid driver's license or other government-issued picture ID to enter the building. Everyone who enters the building will be required to walk through metal detectors. All bags, keys, cell phones and other hand-held items will be sent through X-ray equipment. You may wish to arrive 20 minutes before the conference start time to give yourself time to go through the Bank's screening process. Situated 20 minutes from downtown and the Bank, Lambert International Airport is a great option for getting to St. Louis. Most major airlines (United, American, and Delta) and their partners have flights into and out of St. Louis that allow for international travel. There are hundreds of flights in and out of the airport, making it convenient to get to and from any location. Taxis are readily available at the airport outside of both the main and east terminals. The trip to downtown St. Louis takes approximately 20-30 minutes and costs approximately $35. MetroLink, St. Louis’ light-rail system, connects the main and east terminals of Lambert-St. Louis International Airport to the downtown area. The total travel time from the airport is approximately 30 minutes, and the train runs every 10 to 30 minutes, depending upon the time of day. Call 314-231-2345 for detailed schedule information and current ticket prices, or visit www.metrostlouis.org. If you take the train, disembark at the Convention Center Station, located on the corner of Washington Avenue and Sixth Street. Walk one block south on Sixth Street to Locust Street. Turn left (east) and continue one block to Broadway. The Bank is located at the intersection of Broadway and Locust. 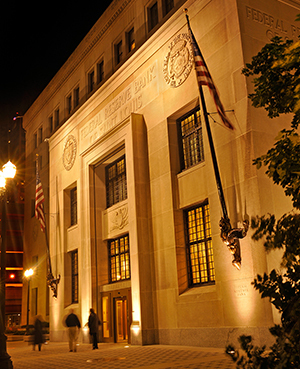 For more information on things to do while in the city, please visit: http://explorestlouis.com/.